Cost: $120.00 per ticket. Tables of 10 (max 11), smaller groups will be required to share. Tickets on sale August 1st. 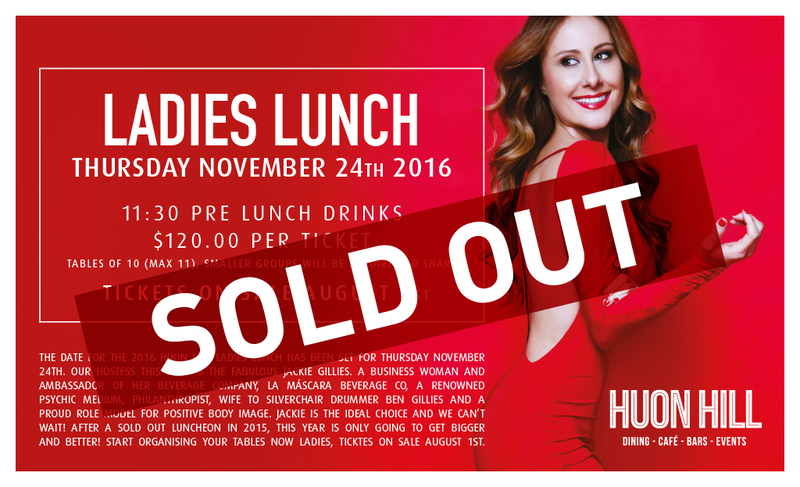 The date for the 2016 Huon Hill Ladies Lunch has been set for Thursday November 24th. Our hostess this year is the fabulous Jackie Gillies. A business woman and ambassador of her beverage company, La Máscara Beverage co, a renowned Psychic Medium, philanthropist, wife to Silverchair drummer Ben Gillies and a proud role model for positive body image. Jackie is the ideal choice and we can’t wait! After a sold out luncheon in 2015, this year is only going to get bigger and better! Start organising your tables now ladies, ticktes on sale August 1st.